With their 160th pick, the Tigers drafted Cam Gibson out of Michigan State. 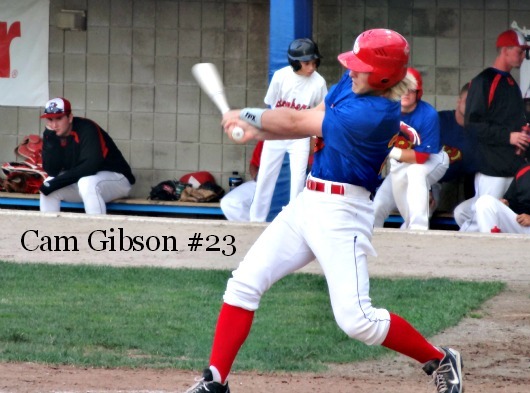 The Detroit Tigers have drafted Cam Gibson in the 5th round with their 160th pick. Not really ground breaking news, other than the fact that Cam is the son of Tiger legend Kirk Gibson. Like his father before him, Cam is currently attending Michigan State University. Of course it’s unknown at this point if Cam, who just finished his junior season, will return to MSU or join the Tigers organization. As a junior, he had a career-best 10 doubles and 17 stolen bases. He hit .294 while hitting five home runs and posting 32 RBI’s. We had a chance to see Cam play back in 2013 when he was a member of the Battle Creek Bombers. Drafting family members of current and former Tiger players and management is nothing new. In fact, Detroit just drafted RHP Ryan Castellanos in the 25th round (760 overall), who is brother to third baseman Nick Castallanos. Over the seasons we’ve seen the likes of Pat Leyland, Colin Kaline, Nick Avila, and Ben Verlander in West Michigan, all relatives to others in the Detroit organization (and I’m probably missing a few). Out of their top picks, though, I think that outfielder Christian Stewart and pitcher Tyler Alexander have the best shot at cracking the Whitecaps roster right out of the draft. I don’t want to comment on the kid. I’ve never met him and don’t know him. But I just don’t get the the Tigers’ organization obsession with Kirk Gibson. I have met him a few times and he is a complete jackass. And if I remember correctly he was anything but a loyal, diehard, Tigers player. Didn’t he and Parish leave the first chance they got for greener pastures? Now, I don’t begrudge anybody, or any organization, for maximizing earning potential or profit, but where does all this nostalgia come from? Trammel and Whitaker, ok. But Gibson? In my opinion, a pompous, overrated turd. Again, the son doesn’t inherit the sins of the father. I guess I’m not sure what I’m saying. But I do like your post. I’ll shut up now. I can only speculate that fans obsession with Gibson comes from him being from Michigan and playing at MSU. The ‘local boy makes good’ angle is always a good one. Like you, I’ve heard some uncomplimentary things about Gibson and his attitude toward fans. Tram and Lou should have their numbers retired and a statue of them ‘turning two’ at Comerica, in my opinion. I’m not sure about the organization’s obsession with him, or if it’s just that they like drafted family members of players and staff. We never met Cam, but if he signs and goes to West Michigan, then we might have a chance at a Sunday game or something. Reblogged this on Flashin' Leather.